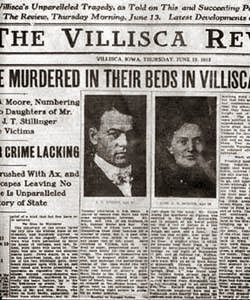 The Villisca Axe Murders occurred at night during July 9th-10th, 1912 at the Iowa home, owned by the Moore family. The Moore family consisted of parents Josiah, 43, and Sarah, 39. Katherine Moore invited Ina and Lena Stillinger (8 and 12) to spend the night at the Moore residence. At 7:00 a.m. the next morning, Mary Peckham, the Moores’ neighbor, became suspicious after she noticed that the Moore family had not come out to do their morning chores. Peckham knocked on the Moores’ door. When nobody answered, she tried to open the door and discovered that it was locked. Peckham let the Moores’ chickens out and then called Ross Moore, Josiah Moore’s brother. Like Peckham, Moore received no response when he knocked on the door and shouted. He unlocked the front door with his copy of the house key. While Peckham stood on the porch, Moore went into the parlor and opened the guest bedroom door and found Ina and Lena Stillinger’s bodies on the bed. Moore immediately told Peckham to call Hank Horton, Villisca’s primarypeace officer, who arrived shortly thereafter. Horton’s search of the house revealed that the entire Moore family and the two Stillinger girls had been bludgeoned to death. The murder weapon, an axe belonging to Josiah, was found in the guest room where the Stillinger sisters were found. Doctors concluded that the murders had taken place shortly after midnight. The killer or killers began in the master bedroom, where Josiah and Sarah Moore were asleep. Josiah received more blows from the axe than any other victim; his face had been cut so much that his eyes were missing. The killer(s) then went into the children’s rooms and bludgeoned Herman, Katherine, Boyd, and Paul in the head in the same manner as their parents. Afterward, the killer(s) moved downstairs to the guest bedroom and killed Ina and Lena. Investigators believed that all of the victims except for Lena Stillinger had been asleep at the time of the murders. Investigators also believed Lena attempted to fight back. She was found lying crosswise on the bed, and a defensive wound was discovered on her arm. Furthermore, Lena was found with her nightgown pushed up to her waist and no undergarments on, leading to speculation that the killer(s) sexually molested her (or attempted to do so). 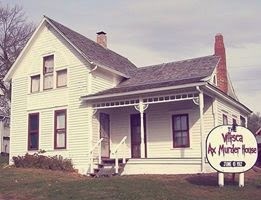 Today, the Villisca house is reportedly to be haunted by the spirits of the victims of the axe murders. There have been alleged sightings of cold spots, shadows lurking, children’s whispers, and objects moving. It is also a bed and breakfast and also a museum, you can even book your stay!